This is my second article of Top 12 Performer Mid Cap Value Mutual Funds of 2010. If you miss the part 1 article, you can find the part 1 here. Similar to small cap stocks, mid cap stocks have been over performing the overall market. The following is the next 4 of this top 12 list. The investment in Fidelity Mid Cap Value is seeking for capital growth in long-term period. The major net assets investment of this fund, at least 80%, is in securities of domestic and foreign companies with medium market capitalizations. The market capitalizations benchmark is similar to companies in the Russell Midcap Index or the S&P MidCap 400 Index. Bruce Dirks is the fund manager since February 7, 2005. The expense ratio of this fund is 0.94% annually, which is quite low compared to the average expense ratio which is 1.36%. This fund has returned 5.24% over the past three years and 3.84% over the past five years. This is a no sales load fund, and as well it applies no 12b1 fee. The minimum balance to invest in this Fidelity fund for either brokerage or IRA fund is $2,500. The top ten holdings out of the 110 total holdings of this fund as of Dec 31, 2010 are Suntrust Banks Inc., Murphy Oil Corp., Discover Fin Svcs, Regions Financial Corp., Macys Inc., Unum Group, Lincoln National Corp., Comerica Inc., Edison Intl and Ventas Inc REIT. These top 10 holdings make up to 14.62% of the portfolio. 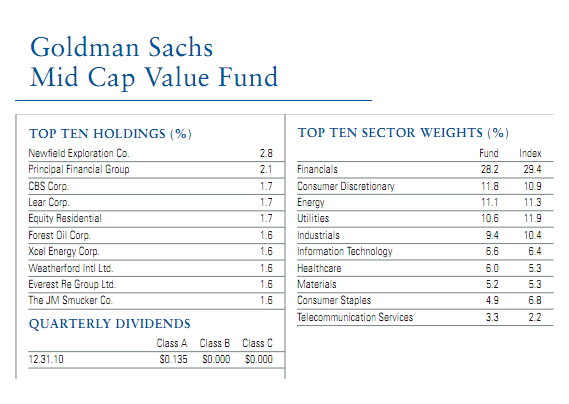 The Goldman Sachs Mid Cap Value fund objective is to provide long term capital appreciation. This fund invests its net assets primarily in publicly traded U.S. securities, and foreign securities. At least 80% of its net assets are invested in a diversified portfolio of equity investments in mid-cap issuers. 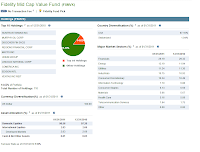 Dolores Bamford has managed this mid cap value stock fund since 2002. This fund has 0.25% 12b1 fee and 5.50% front-end sales load. It has 1.16% expense ratio per year. This Goldman Sachs fund has returned 22.51% over the past 1-year and 4.04% over the past three years. The minimum balance to invest in this fund is $1,000 for brokerage account (same applied for GCMCX) and $250 for IRA account. The other class tickers of this fund are GCMBX, GCMCX, GCMTX, GSMCX, GCMRX and GSMSX. Some other class has lower expense ratio and different minimum balance investment. As January 2011, the top 10 holdings of this fund are Newﬁeld Exploration Co. (2.8%), Principal Financial Group (2.1%), CBS Corp. (1.7%), Lear Corp. (1.7%), Equity Residential (1.7%), Forest Oil Corp. (1.6%), Xcel Energy Corp. (1.6%), Weatherford Intl Ltd. (1.6%), Everest Re Group Ltd. (1.6%) and The JM Smucker Co. (1.6%). Hartford MidCap Value HLS investment seeks capital appreciation in long-term period. The percentage net assets investment of this fund is 80% in mid-capitalization companies and 20% in securities of foreign issuers and non-dollar securities. The mid-capitalization companies are companies with market capitalizations within the range of the Russell Midcap and S&P 400 MidCap Indices. This Hartford fund is managed by James N. Mordy since April 30, 2001. This fund charges an annual expense ratio of 0.85%. But this fund is now closed to new investors, you may invest either in retirement account or 401k account. This fund applies no 12b1 fee and no sales load. This mid cap value fund is not available in IRA. It has returned 29.23% over the past one year, 7.39% over the past three years and 5.05% over the past five years. This fund can be purchased from only 7 brokerages, which are Northwestern Mutual Investor Service, Schwab RPS SDE, WR Hambrecht Co, Schwab RPS All, Matrix Financial Solutions, Trade PMR Transaction Fee and ADP Access OFA. 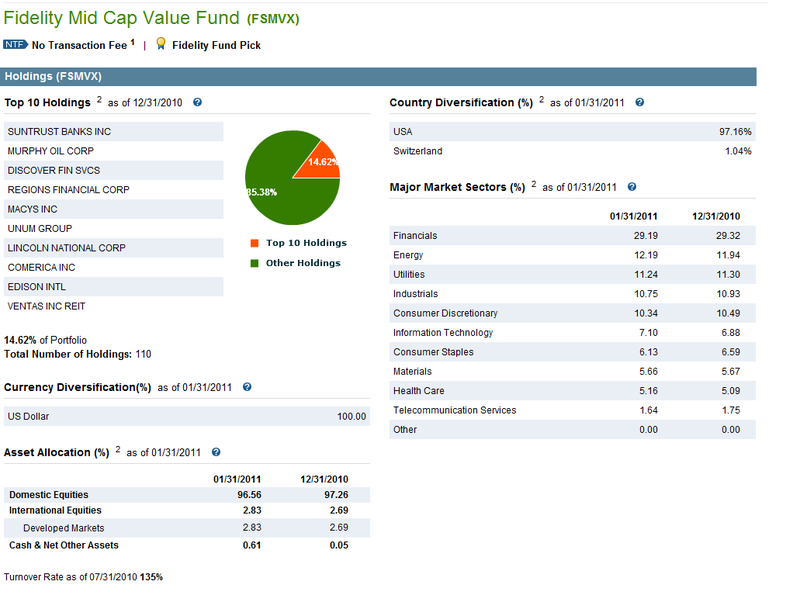 The other class of this fund is Hartford MidCap Value HLS IB (HBMVX) with 1.1% expense ratio and 0.25% 12b1 fee. The top 10 holdings of this fund are Arrow Electronics, Inc. (2.6%), Phh Corp. (2.4%), Virgin Media, Inc. (2.4%), Varian Semiconductor Equipment Associates Inc. (2.3%), Buck Holdings L.P. (2.1%), Delta Air Lines, Inc. (2.0%), Reinsurance Group Of America, Inc. (2.0%), Cigna Corp. (1.9%), Br Properties S.A. (1.9%) and Unum Group (1.9%). These holdings make up of 21.5% of the total net assets portfolio. The investment in RidgeWorth Mid-Cap Value Equity mainly purpose is seeking for capital appreciation. Provides current income is the secondary purpose. The major net assets investment of this fund is in domestic equity securities of mid cap companies. The priority is at the companies with market capitalizations similar to those of companies in the Russell Mid-cap Index. Don Wordell has managed this fund since Nov 30, 2001. The expense ratio of this RidgeWorth fund is 1.32% which is almost similar to the average in category (1.36%). The 12b1 fee for this fund is 0.30%. It has 5.75% of front end sales load. This mid cap value mutual fund has returned 21.81% over the past one year and 7.83% over the past five years. The minimum balance to invest in this fund in either brokerage or IRA account is $2,000. The other class tickers of this fund are SMFVX and SMVTX. Top 10 holdings of this fund are BB&T Corporation (3.1%), Northern Trust Corporation (2.9%), Intl Game Technology(2.9%), Comerica Incorporated (2.7%), Ashland Incorporated (2.6%), Hartford Financial Services Group (2.5%), MB Financial Incorporated (2.4%), Flowserve Corporation (2.3%), RR Donnelly & Sons Company (2.3%) and EOG Resources Incorporated (2.2%).